Again, I live for the sangria-colored packaging of Paul & Joe's Midnight Sangria 2015 Summer Collection. The wrapping perfectly encapsulates the collection's theme of sensuality, and romance, of a Summer evening in Spain. The collection features three eyeshadow, and lip gloss duos, and (as the SA informed me) both products are fashioned to be applied with your fingers; which, I feel, continues the whole sensual, carefree/hassle-free theme. This post features a look I've worn several times, (including last Friday) pairing the Eye Color M Ole 002 (3,024 yen), with the Lip Gloss M Midnight Sangria 001 (2,700 yen); love this combination. 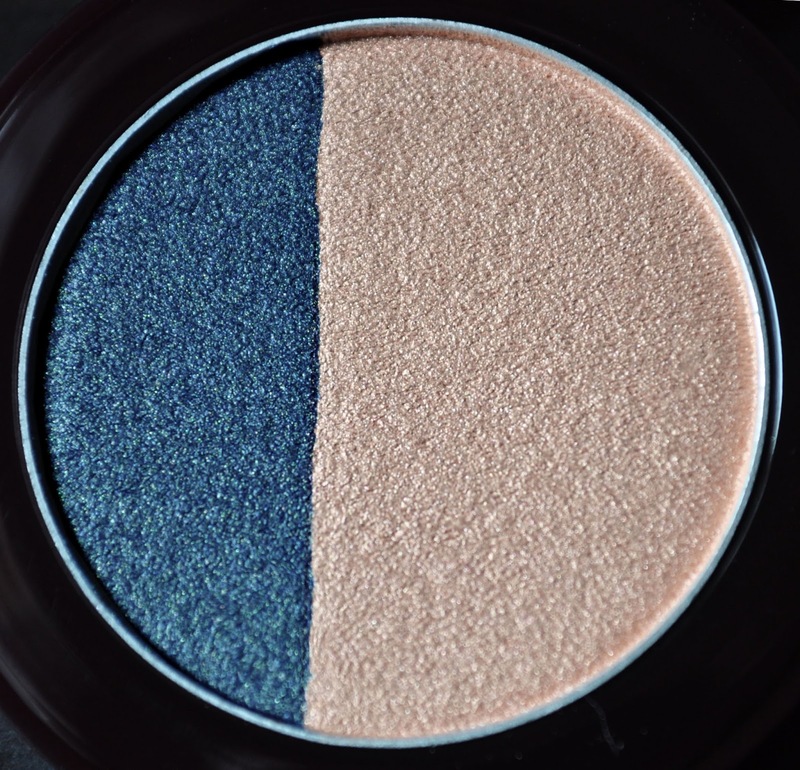 The Eye Color M Ole 002 offers two silky-smooth, pigmented shades that can be worn alone, layered, blended, or mixed together to create an entirely new third shade (bonus!). I like how buildable and easy to blend these eyeshadows are; offering a soft wash or vibrant color. 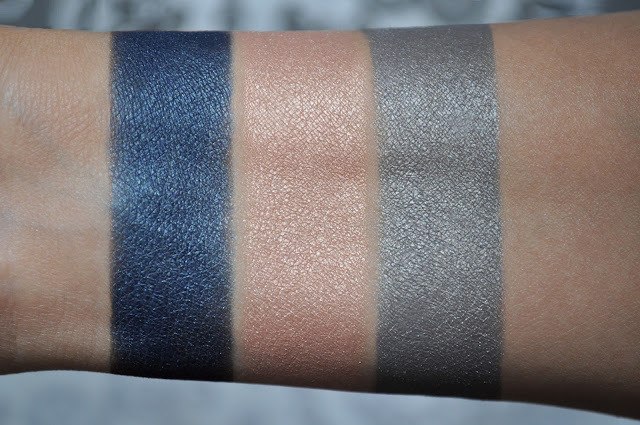 Both shadows have a shimmery, luminescent-pearl finish. A patinated, murky, seafoam blue. 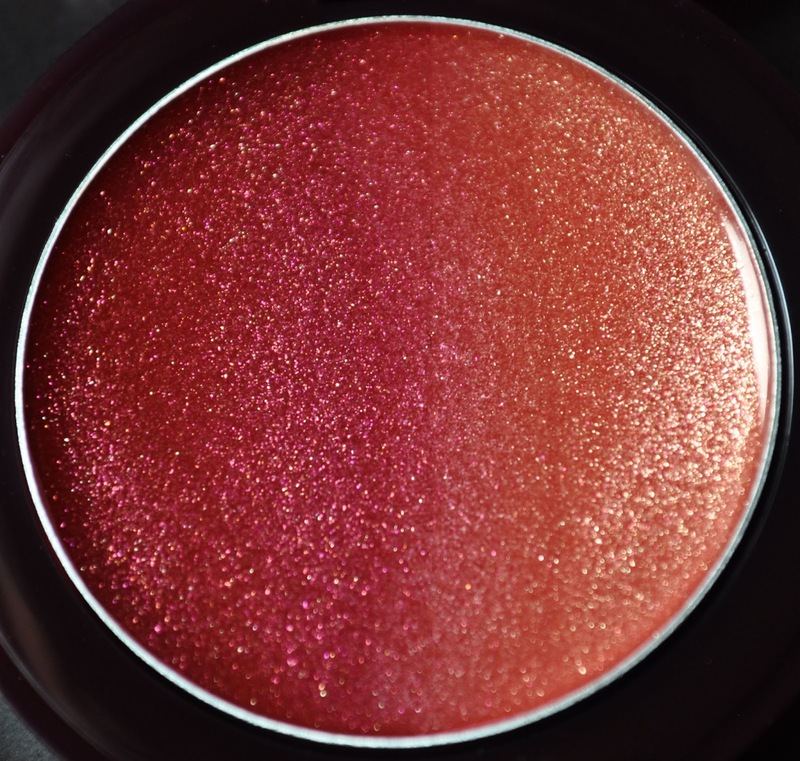 How gorgeous are the gradation of the colors of the Lip Gloss M Midnight Sangria 001?! Just like Ole 002, Midnight Sangria 001 offers a cocktail of three color combinations. 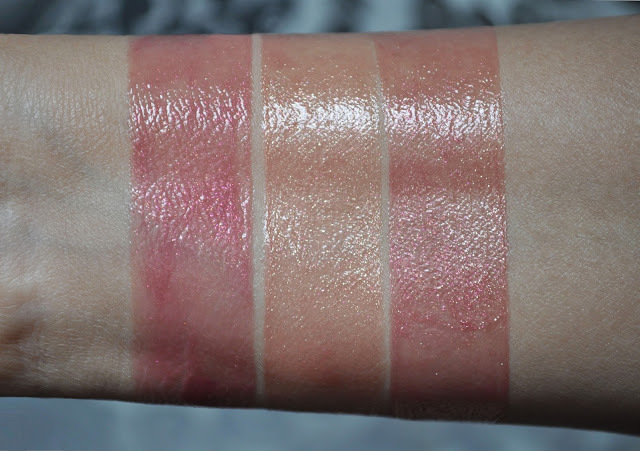 The Lip Gloss Ms have a balmy, slightly tacky, consistency and give the lips a good amount of moisture. 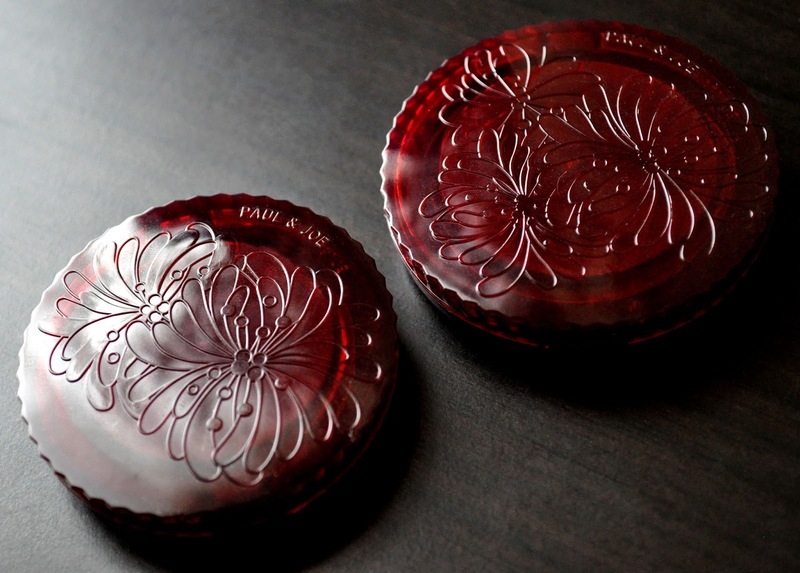 Without eating, and an occasional sip of a drink, I get about 3 to 4 hours of wear before needing a touch-up. Midnight Sangria 001 gives the lips a flirty, shimmery, sheer splash of color (which I'm totally okay with during Summertime when I want the ease of a juicy, hint of color pout). A reddish-berry wine with pink and gold micro-shimmer. A bronzed-peachy-gold with pink and gold micro-shimmer. A bronzed wine with pink and gold micro-shimmer. Les Merveilleuses Laduree Mixed Pressed Cheek Color in 106. Shu Uemura Hard Formula Eyebrow Pencil in Walnut Brown 07. MAC Paint Pot in Painterly (eyeshadow base). 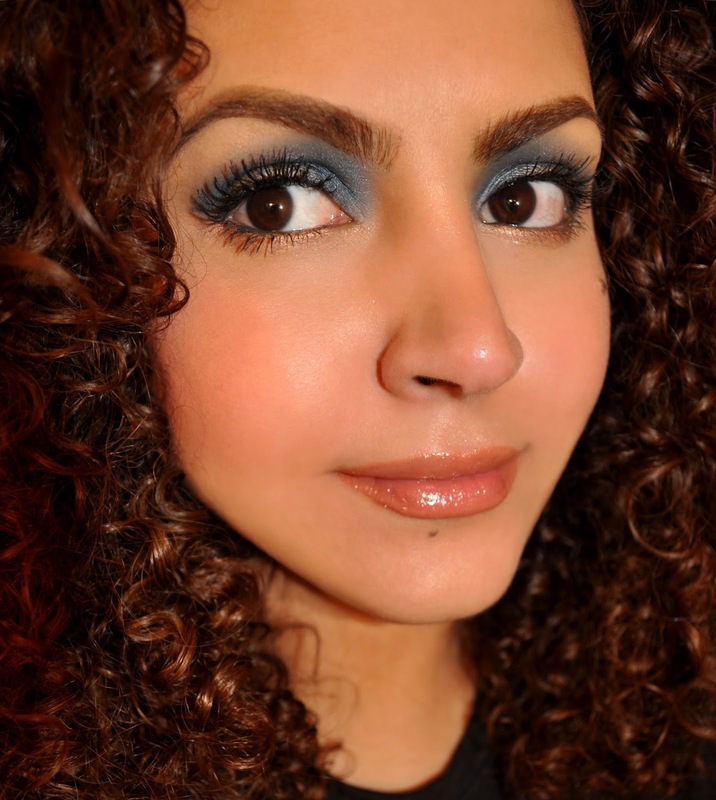 The teal-blue (blended all over the lid and up into the inner crease and patted over the Stila Kajal Eye Liner on the waterline). The beige-pinkish-peach (on the lower lash line and lined along the center on the upper lash line). Stila Kajal Eye Liner in Smoky Quartz (used to tightline and on the waterline). Helena Rubinstein Lash Queen Feline Blacks in 01 Black Black. Paul & Joe Lip Gloss M in Midnight Sangria 001 (both sides mixed together, but using a little more of the bronzed-peachy-gold). I've been using these products so much this season, that I've made a good dent in Ole 002, and I'm starting to see some pan peeking through Midnight Sangria 001. Beautiful hair. Are you wearing false lashes? Hey Anonymous! Thank you, but you know how it goes, girls with curly hair always want straight hair, and vice versa. Nope, those are my lashes. It's so hot and humid here for falsies. Plus, I really don't like wearing them at all. YES! Natural beautiful curly hair! Big hugs from Greece! Wow! You have fantastic hair! Lol, you're all welcome too it :P I do like being able to go from Curly to straight whenever I like. But, when it's exceptionally humid, I can't bear the frizzed out puff it becomes.